Most of us apply the “reduce, reuse and recycle” mantra in many ways during the day. As veggies we reduce our ecological footprint with our choice to eat lower on the food chain (go, plants!). Likely we’ve invested in canvas bags that we can reuse time and again when buying aforementioned plants. And of course we recycle: everything from batteries to beer bottles. But what’s better or lacking in this mantra is repurposing, something my friend Alex of Stay Vocal has imbued in his vegan company’s motto and merchandise. Others refer to it as upcycling. Call it what you will, but the creative duo Jen Jones and Carol Sirrine have applied it to the arts and crafts world with their handy dandy how-to manual geared towards tweens and their older classmates, Re-Craft. 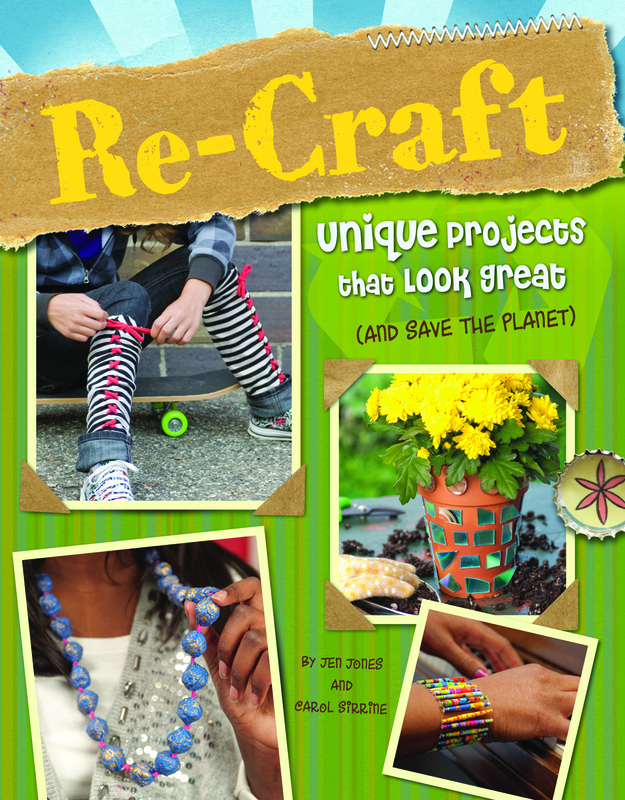 Re-Craft is broken up into 4 main chapters based on the key material(s) used for each DIY project: old clothes, recyclables, all natural (twigs, acorns), and paper/cardboard. 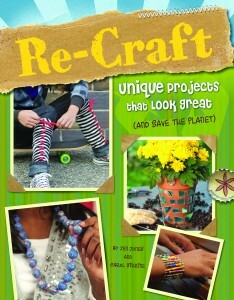 There are plenty of projects for girls to wear: soda can-yarn bracelets, shoulder bags made from an old pair of jeans, and “candy wrapper” rings. But there’s also plenty to decorate a t(w)een’s home and home away from home: CD photo holders for the locker, a desk organizer with used ribbons, and frames aplenty! But luckily not all projects are self-absorbed (sorry, did I say that?). A string of peanut butter slathered pinecones makes a beautiful bird feeder, while old t-shirts cut up into strands (T-yarn) are hand woven to create dog toys. The pages abound with ideas on how to better improve one’s green practices, from composting to recycling old clothing scraps, and put forth interesting and scary enviro-facts. Did you know that scientists guess that it will take one CD a million years to break down? Yikes! Vegans should be aware that I only detected 1 non-animal-friendly item used as a material in this book: feathers for the Native American-inspired dream catcher. Unfortunately, birds do suffer in the “harvesting” of such feathers. A great find for an artsy fartsy kid.